It's very easy to forget that there's an Arm of the Grand Union Canal in Aylesbury. The town centre is completely separate and it's only ever when I drive over one of the canal bridges, that I think we really must take a walk along by the canal. Saturday was the perfect opportunity to show Little Miss A this part of the town that she lives in. We started at the end of the Canal behind the Waterside Theatre. 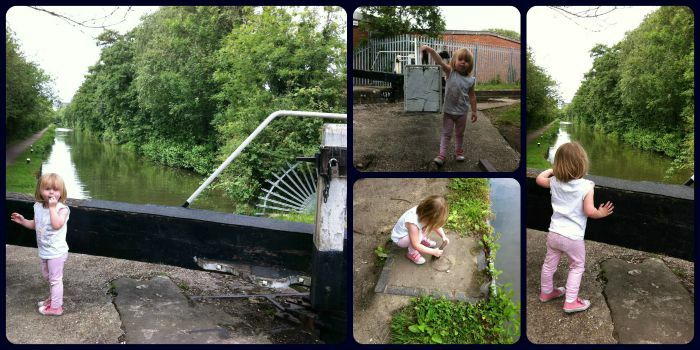 We were fortunate that a barge was just setting off so Little Miss A got to see her first barge actually in motion! I had a feeling there would be quite a few ducks along the way so had gone prepared with some food. Just as well as we kept encountering lots of large groups of them. At one point, some decided to follow us! Little Miss A was interested in the locks and the water gushing out. On our way back we timed it just right as there was a barge just coming into one of the locks so we stopped to watch it rise up to our level. I think we'll have to take her on a Barge trip some time. She's got it in her genes as one of her ancestors was actually a Lock Keeper in the late 1800s! There was lots along the walk to keep her interest. We ventured off the tow path at one point and actually found a small playground - Denby Walk Play Space. Perfect! After Little Miss A had spent quite a while in the playground, we decided to head back. 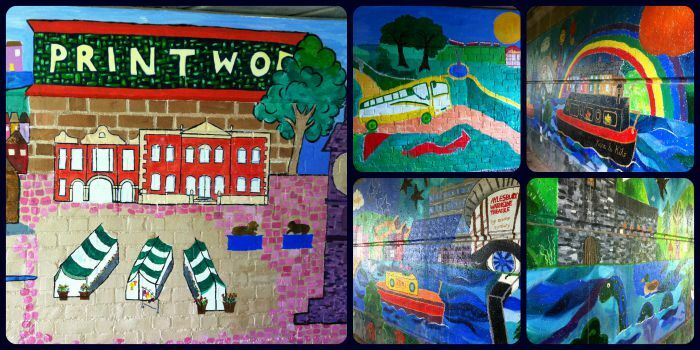 Along the path as you go under some of the bridges are the most amazing wall murals. Something you'd never know were there unless you passed them on a barge or walked this tow path. We encountered a group of volunteers actually working on a new mural. The colours were so bright and cheerful. We'll have to take another wander down there to see the wall when it's finished! 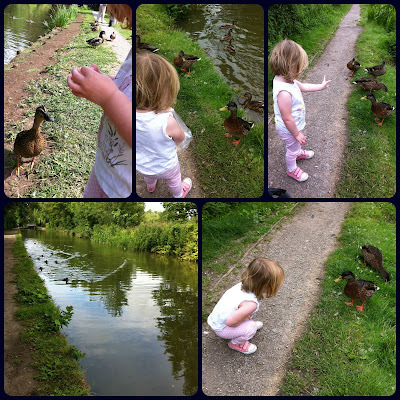 I really enjoyed taking Little Miss A along the Canal. Definitely a walk I'll do again with her. That night I sang Little Miss A one of my favourite camp fire songs, called 'Barges', that I learnt as a Girl Guide. I've song this to Little Miss A since she was born as it was one of the only lullaby type songs I could remember when I found myself alone with a crying newborn in the hospital at night after her birth. I can see the Barges flickering light. Barges, have you treasure in your hold? 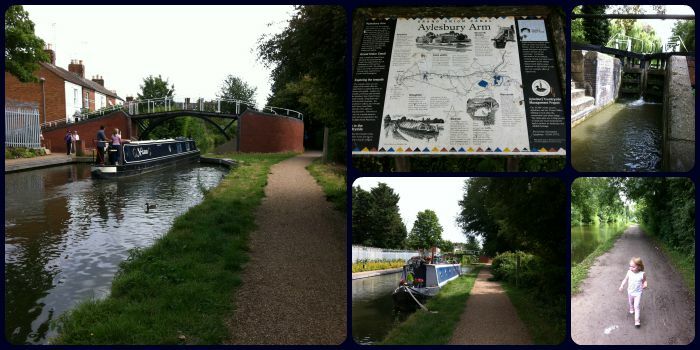 You can find out a bit more about the Aylesbury Arm of the Grand Union Canal on the Canal & River Trust website. 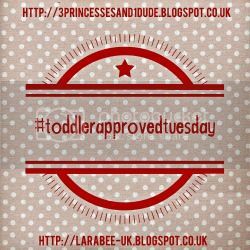 What is the towpath like, it's fine for the 3.5yr old but I worry for the wheels on the 1yr old's Phil and Teds. I don't want a puncture. I had our pushchair with me, Jane, though LO walked most of the way. The path is absolutely fine, didn't have any problems with the pushchair. I know, the murals are really amazing. I'm sure so many people don't know they're even there!